It probably won’t be available for at least another week. Last week, Fortnite: Battle Royale players who completed 60 weekly challenges finally gained access to the season seven Snowfall skin: The Prisoner. Soon after the skin became available, though, players quickly figured out how to upgrade The Prisoner and unlock its second stage. And once stage two was unlocked, players were frantically trying to figure out how to get the third stage of the skin. Well now, the wait is over—stage three became available on Feb. 7. All you have to do is interact with a campfire near Paradise Palms and the new variant of the skin will be yours. But now, players are already on the hunt for stage four of The Prisoner skin. Just like with stage three, however, the next stage of this skin isn’t available now—and it’ll most likely stay that way until at least next week. Even though stage four isn’t available yet, we have some idea of what the skin could look like thanks to YouTuber KillerKingKevin. The leaked stage four skin in this video obviously isn’t confirmed by Epic Games, however. Whenever the fourth stage becomes available, players will likely need to interact with another unique object—we can assume that it won’t be a key or campfire again. 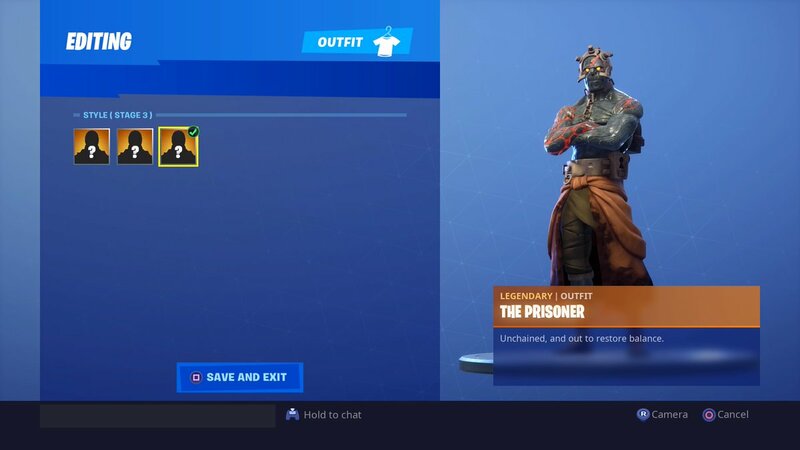 Once you unlock stage three of The Prisoner skin, take a break from looking for stage four and just enjoy some Fortnite—or work on finishing the season seven challenges.